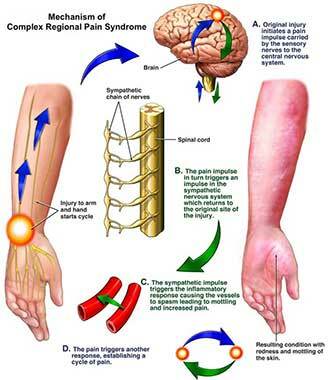 Complex regional pain syndrome, or CRPS, (also known as Reflexive Sympathetic Dystrophy – RSD) is a complex, poorly understood chronic nerve pain condition of the extremities. Also called reflexive sympathetic dystrophy, it was thought that the unusual constellation of symptoms occurred only after direct damage to a nerve serving an arm or a leg. However, research has shown that over 90 percent of patients who suffer from this rare malady have never had a direct injury to the nerve in question. Besides pain, CRPS can cause abnormal hair growth patterns, skin color and temperature changes, and changes in skin texture in the affected extremity. The exact cause of this condition is, therefore, unknown, but treatment can be quite effective when supporting the symptoms. A small percentage of patients who get CRPS suffer nerve damage in the affected extremity, such as from nerve damage caused by peripheral neuropathy or direct stretching or severing of the nerve. Much more commonly, this condition occurs as a result of trauma to the extremity, such as amputation, fracture, or crush injury. 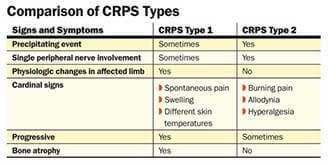 However, some people experience CRPS after surgery on the extremity or after minor injuries, such as a sprained ankle. In short, anyone can get CRPS, but it is more likely in patients who have experienced some sort of trauma as a precipitating factor. Researchers are still not sure what causes CRPS, but it is thought that a miscommunication between the central and peripheral nervous system triggers an inflammatory response. Constant, burning pain is usually felt in the arm or hand, leg or foot. Many patients experience allodynia, or a sensitivity to touch that can make even innocuous stimuli extremely painful. Cold intolerance in the limb is another common painful sign, and the extremity will often swell up as the inflammatory process rages on. The skin will also exhibit changes in color, temperature, and texture. Stiffness of the involved joints, including of the hands and feet, can also occur, and muscle spasms are commonly contributory to the overall discomfort. Although it does not hurt, the hair and nails involved with the condition will grow abnormally, and this is an indicator that CRPS is involved rather than a more common nerve problem, such as diabetic peripheral neuropathy. 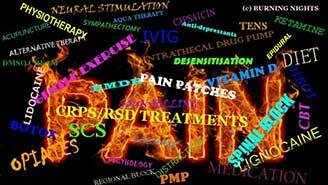 The most important treatment for CRPS is physical therapy. The goal is to move the extremity as normally as possible to prevent atrophy of the muscles and bones. High repetitions with low weights is the best way to strengthen an extremity affected by CRPS. Equally important is to challenge the sensory nerves of the affected extremity to desensitize them to the pain. A physical therapist will perform desensitization techniques including touching the painful extremity with a variety of different textures and alternating temperatures between cold and warm. Once learned the right way to do these strengthening and desensitization techniques, they should be continued at home. Pain Medicine physicians are vital in the treatment because sometimes the pain is so severe that physical therapy is intolerable. The Pain Medicine physician will help provide pain relief to help someone suffering from CRPS to tolerate physical therapy better. Interventional techniques, such as a stellate ganglion block for upper extremity CRPS or a lumbar sympathetic nerve block for lower extremity CRPS can help determine if the sympathetic nervous system (part of the nervous system that helps us run or fight in times of danger) has somehow become wired in to the part of the nervous system that sends pain messages. These procedures can reduce pain significantly when the sympathetic nervous system is involved with the persistence of the pain in the extremity. A Pain Physician can also prescribe oral medications that can reduce pain so that physical therapy can be performed. For example, non-steroidal anti-inflammatory drugs (NSAIDs) are helpful to relieve the faulty inflammation and help ease joint pain. Antidepressants and anti-convulsants are important in treating and managing the pain that arises from nerve involvement. If there is an area that has extreme pain with even light touch, a local anesthetic patch can help numb the area, thereby providing pain relief. When the pain is in a more localized area, many patients find relief with the use of topical pain creams that are applied to the painful area a few times in a day. The same medications that can be taken by mouth can be mixed into a compounded cream that is specially ordered for this condition. Compounded creams have the benefit of avoiding medication side effects from oral use, but can be expensive. In cases where the pain is extreme, opioids are used, but only when the other treatments used in tandem fail to control pain. Whenever opioids are prescribed, a patient is evaluated in advance for their risk of addiction to the opioid. Functional goals are established and a monitoring program is determined and agreed to in advance with the input of your primary care physician. Finally, spinal cord stimulators (SCS) can be extremely helpful in reducing the pain of CRPS if the above treatments have not provided satisfactory pain relief. 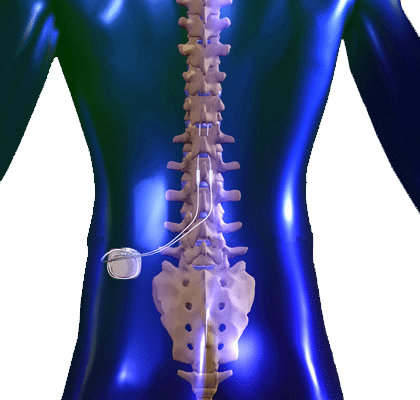 The SCS is a thin wire that your Pain Medicine physician threads into the epidural space of the spine. There are electrodes at the tip of the wire that when connected to a battery can provide a programmable current that blocks the pain with a much more tolerable and pleasant buzzing or tingling sensation. The spinal cord stimulator is placed first in a temporarily for a few days to see if it helps the pain and is acceptable to the patient. If it indeed helps with pain and movement of the painful extremity, then a surgical procedure is scheduled to place the wire and battery more permanently under the skin. Studies have shown that a spinal cord stimulator significantly improves the function of a limb afflicted with CRPS.